And just for some variation, later on Goddess Mansa decides to try out a fish theme with a wonderful headdress. But there are also plenty of real snakes throughout – not just on the costumes – although the film seems to use a combination of some really quite bad model snakes interspersed with the real thing. These are some of the real ones. Naag Panchami starts with the rather petulant Snake Goddess Mansa having a bad day. It’s her birthday but she is restless and irritated by her followers in Naglok. Fortuitously Nagraj turns up and she manages to cajole him into revealing the name of her father, who is none other than Lord Shiva. Mansa is thrilled by this news and immediately goes to see her father who takes her to meet her mother and siblings in Khailash. Once there she discovers the existence of ‘the rest of the world’, and decides she wants to be worshiped just like Shiva and the other Gods. To achieve her aim she decides to make Lord Shiva’s chief devotee Chandrakhar her worshiper too, and to that end she appears to him on board his ship and demands his instant worship. But the successful merchant is unimpressed by Mansa and reviles her for her arrogance and presumption. Various ploys by Mansa to force his worship fail to work and finally she kills all six of Chandrakhar’s sons. Mansa seems to work on the theory that the more insane her actions, the more likely it is that Chandrakhar will devote himself to her, which of course is guaranteed to have the opposite effect entirely. Lord Shiva very wisely declines to get involved so the scene is set to allow Mansa to do her worst. As part of her long term plan she then approaches Chandrakers wife Alta and gifts her with another son – not really a lot of consolation for the lost of the last six, but then that’s not her ultimate plan. Rivers flow, birds fly and suns set as he grows up incredibly fast to be the handsome and dashing Lakshmindra. Lakshminda crosses paths with the equally daring and beautiful Behula when she is out hunting. Naturally the two fall in love and in next to no time determine to marry. Meanwhile, Mansa’s chief handmaiden Maithreyi has also married and as husband and wife are cavorting in the forest, Lakshmindra inadvertently runs over her husband in his chariot, killing him instantly. Unaware of this fresh disaster Lakshmindra is now under threat of death from both Mansa and the vengeful Maithreyi – a situation with plenty of snakey potential. It all becomes very Sleeping Beauty-ish as Mansa turns up to the engagement and threatens Lakshmindra with death on his wedding night. Queue evil laugh Mwah ha ha ha! Even Maithreyi is starting to look a bit worried! To protect his son, Chandraker orders a house to be built of iron to ensure that nothing will be able to enter and kill his son. Now I would have thought that an iron house would be quite impractical , hot in summer and hard to keep warm in winter, and not necessarily the only way to keep snakes at bay. Nevertheless, the newlyweds end up in a supposedly impregnable house on their wedding night. Except of course it isn’t. Maithreyi turns up to seek her revenge, but Behula is resolved to save her husband and manages to convince Maithreyi not to kill Lakshminda. 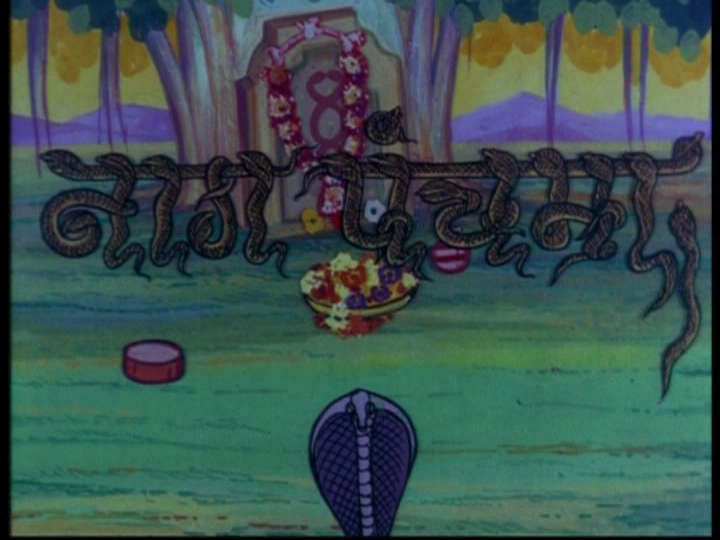 Sadly though, after Maithreyi leaves, neither Behula nor Lakshmindra think to bung up the hole in the wall and Mansa sends another snake which does manage to complete the job. Not one to be easily defeated, Behula resolves to carry her husband’s corpse on a pilgrimage around various temples in order to revive him. While on her quest, Mansa assails Behula with many really bad special effects including a huge crocodile and lightning induced blindness just to name a few. We also get to see that not all snakes are bad, or at least not all the time, as Maithreyi turns up to help Behula in her snake form, towing the body to safety and waking Behula up with a nicely placed spray of water. I really do think all of this would have been much easier to accomplish as a human, but probably nowhere near as much fun to watch. I really enjoyed this film. 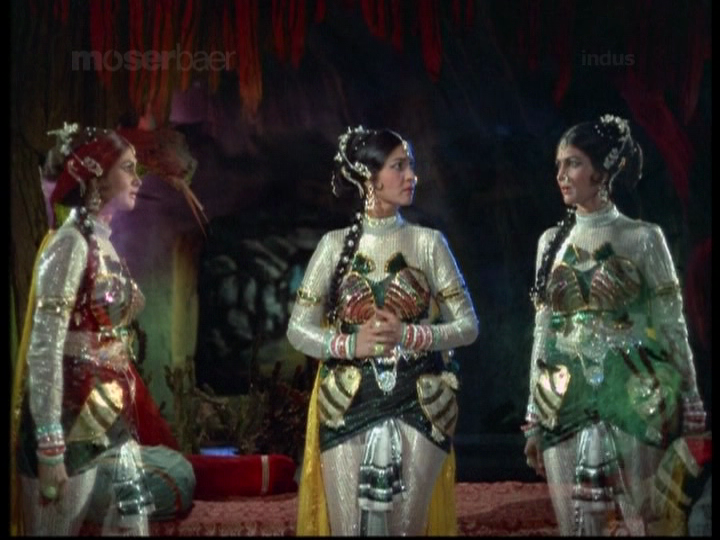 The costumes are wonderfully sumptious and there is just oh so much evil that Mansa manages to accomplish. The songs are fantastic and with playback singers Asha Bhosle, Kishore Kumar and Lata Mangeshkar and music by Ravi it all sounds beautiful. 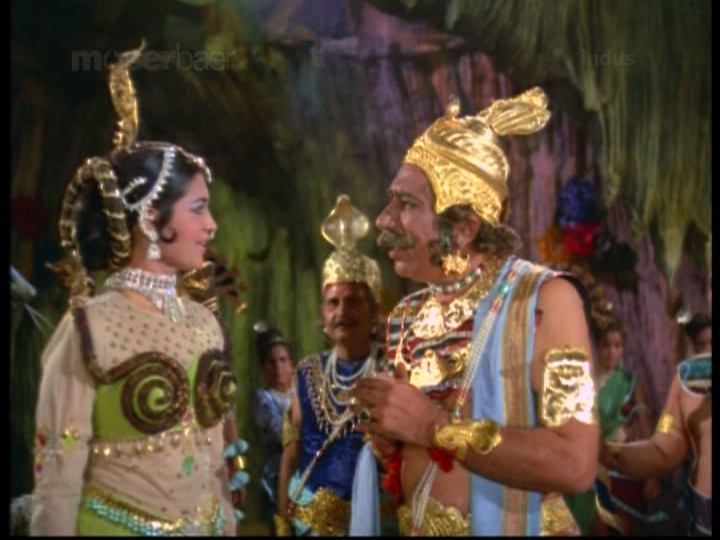 There is even a great snake dance by Maithreyi as Mansa looks on in her fab fish ensemble – already mentioned by jenni, but I think it deserves to be seen again. 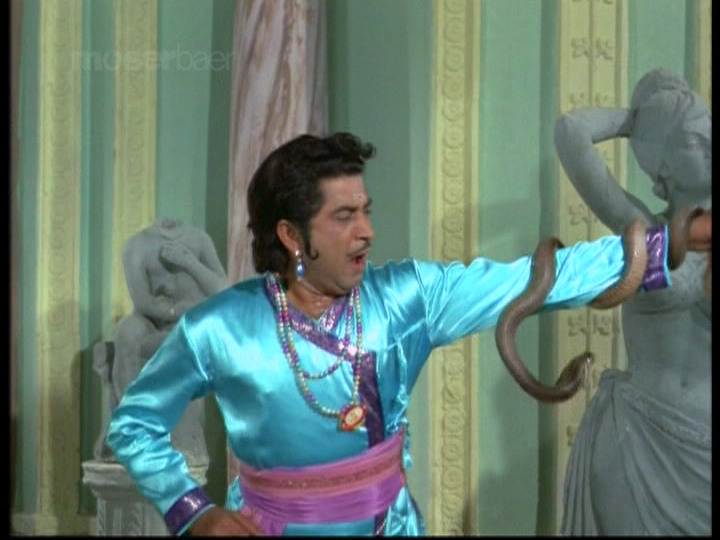 The snakes here do conform pretty much to the standard in the Filmi Snake Spotters Field Guide. There is the less is more approach to clothing, plenty of embellishments and headdresses, great eyes and plenty of snake inspired architecture to pose with. Mansa also has the ability to conjure snakes whenever she is feeling annoyed with someone and flings them around with gay abandon. She becomes more and more maniacal and Shashikala is wonderfully crazy, changing from self-indulgent and immature one minute to totally malevolent and insane in the next. Her eyes get wider and wider and she is definitely a master of ’the look’. She even talks to herself. 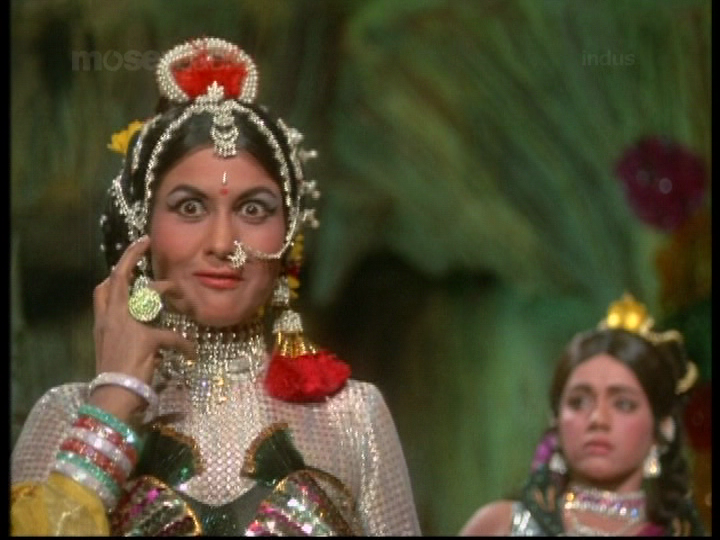 Maithreyi (Jayshree T.) is much less vengeful despite losing her husband, and a much nicer person snake all round. Hers becomes the voice of reason which Mansa of course totally ignores. 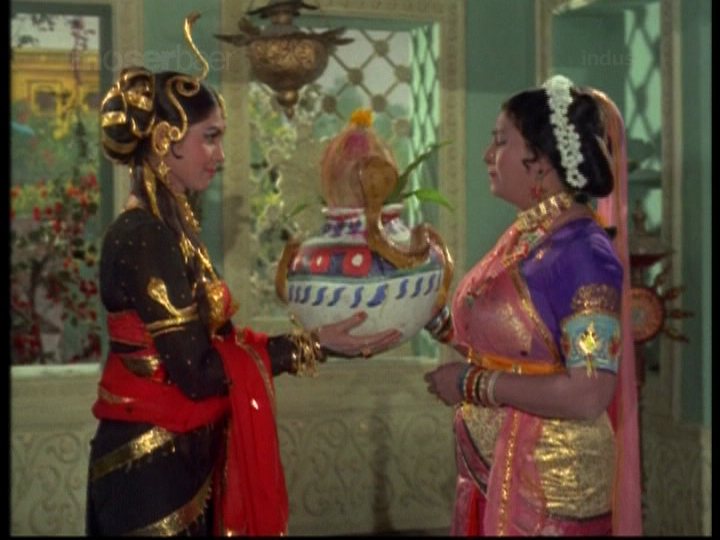 Jayshree Gadkar is lovely as Behula. She invests her with grace and determination and plays the devoted wife perfectly. Out of her lavish costumes as the princess she looks beautiful in her plain sari when she is making the pilgrimages around the various temples. The other actors are all fine but are mainly just there as targets for Mansa. Prithviraj Kapoor is suitably imposing as the rich merchant, and Ashish Kumar does a good job as Lakshmendra. Satyendra Kapoor has a small role as Lakshmendra’s friend Vishwavardhan and makes the most of it. 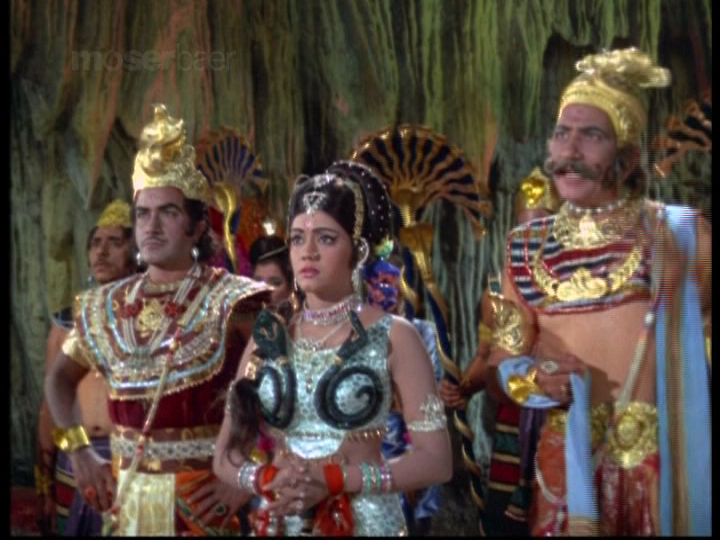 The end involves various Gods and Shiva dancing to shake the world – yet more excellent costumes and ‘bad enough to be really good’ special effects. 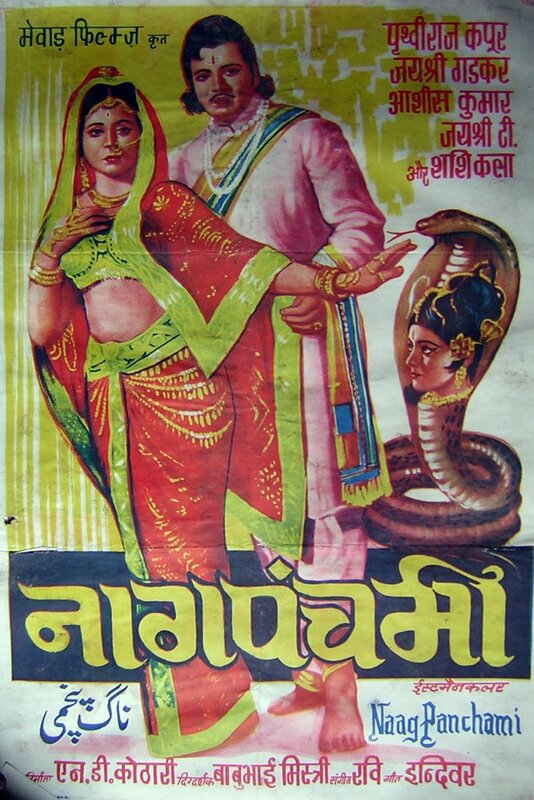 This is so much more than just another snake movie and I’m rather surprised that it doesn’t seem to have the recognition I think it deserves – if only from aficionados of shiny fabric and bejewelled headdresses. A great film for Nag Panchami Film Fessstival I love it! 4 stars. This entry was posted in Bollywood and tagged Asha Bhosle, Ashish Kumar, Babubhai Mistri, Jayshree Gadkar, Jayshree T., Kishore Kumar, Lata Mangeshkar, Naag Panchami, Nag Panchami Film Fessstival, nagfilmfest, Prithviraj Kapoor, Ravi, Satyendra Kapoor. Bookmark the permalink. WOW! I was sold on this by the first few pictures (I have a special soft spot for animated titles and this one looks so wonderfully thematic). This sounds like such good fun! It also serves as a telling contrast to the film I just reviewed, which had NONE of these elements, even in scaled-down budget-friendly forms. I had to give it a #snakefail. It is great fun! Although the story is fairly ridiculous, the costumes and totally over the top snake goddess are just wonderful 🙂 Again costumes seem to have eaten up most of the budget, but they did go all out in terms of number of snake appearances, and I guess for the early seventies the effects are quite spectacular. They certainly pack enough of them in! There are lots of colour block slides flashed up in between some of the scene changes as well for some reason, and while the animations are very basic (and I do mean basic!) they are very cute as the snakes handle the cameras, sound equipment and presumably other roles as each name is flashed up. Heather, I love your screen caps. I had seen the songs and thought they were colourful and the clothes beautiful but the whole movie looks gorgeous and I can’t wait to watch it! And glow in the dark crocodile teeth and crayon lightening as well as snakes. Very excited!. 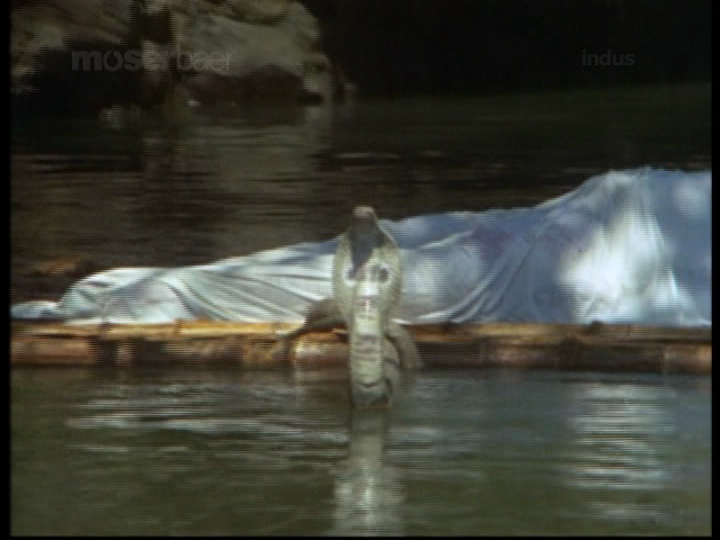 And with reference to Beth’s review – one of the snake statues in this film looks a little bit weaselesque too. The costumes are totally fab. There is so much more packed into the story that I haven’t even mentioned and the effects are amazing in so many ways – I’m quite sure you will love it! My favourite game here was spotting the real snake. 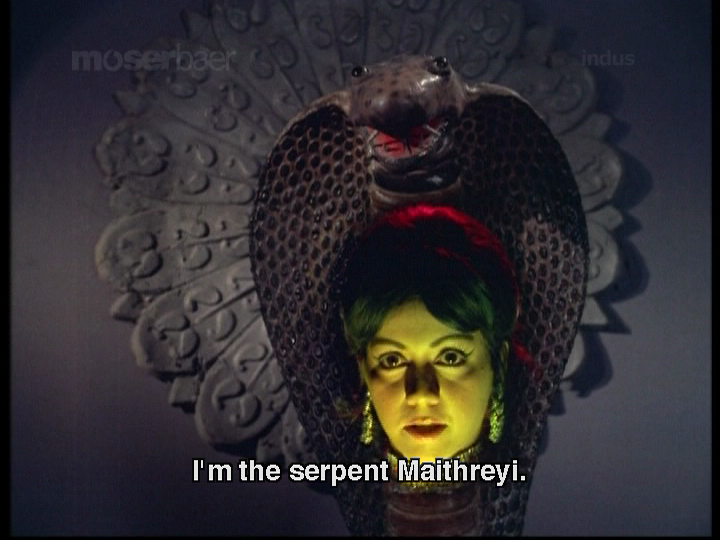 In the song with Behula entreating Maithreyi not to kill her husband they keep swapping in and out a real snake with a terrible fake one, when really the real snake was just as effective slithering around the room. The coiled up model just looked silly and not scary at all. This keeps happening throughout the movie, so I kept disturbing the cats by yelling real, fake, real etc every time a snake appeared – which was very often! This was on my 2nd watch though – I was pretty much speechless the first time round! Perhaps there is a small sub-genre of cinematic tropes of snake weasels! We must investigate! I also think there must be some sort of complex mathematical formula about number and type of snakes or snake-like humans or snake art etc that can estimate fairly accurately how good a movie will be. E.g. 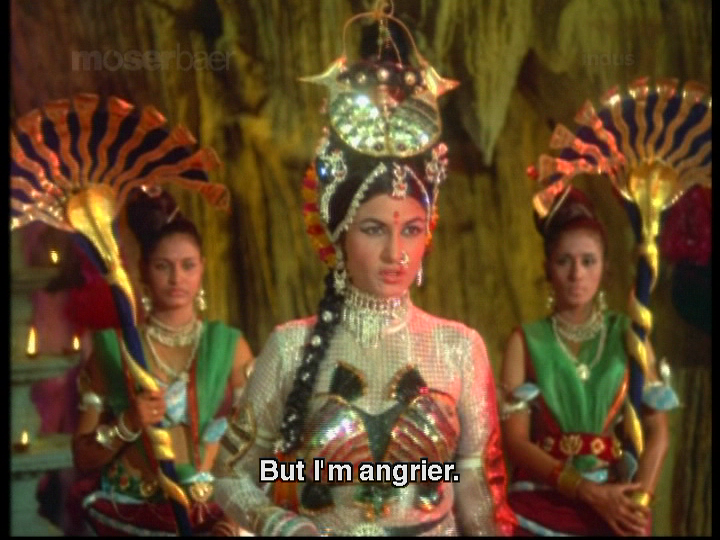 Naagbharna had no snake architecture, no snake interior decor, one very poor snake dance, one very poorly lit snake dance that might have been acceptable had I been able to see it, and very lame outfits that only looked a bit snaky because the title had suggested they should. 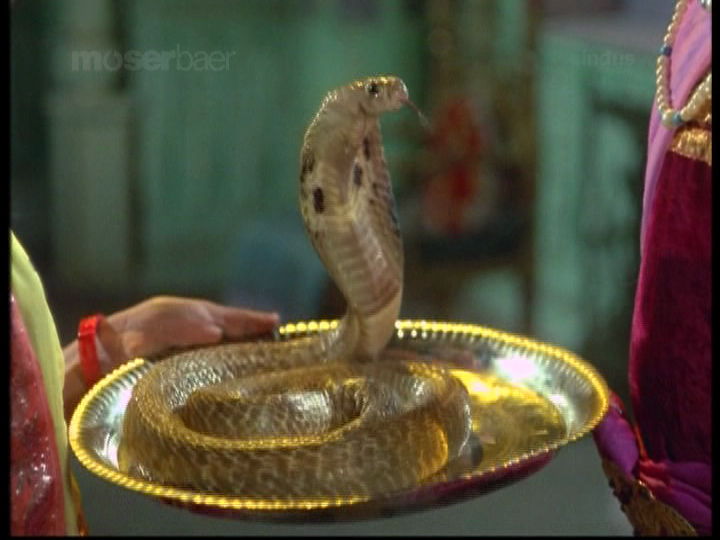 So it has a very low Filmi Snake Input Value to begin with. 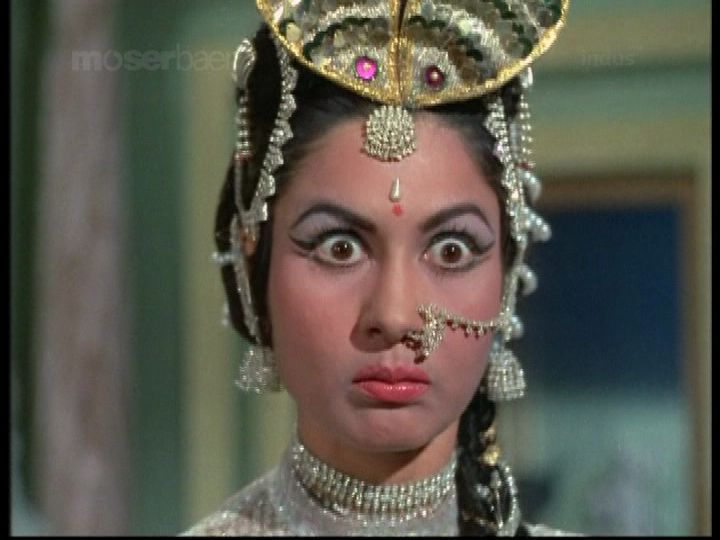 Once you divide that number by the very high amount of bad acting and stupid talk-talk-talking, the film was doomed! I tend to agree – but on that formula Sweta Naagu should have been better than it was – although the denominator (bad acting) was pretty high too! This film should come out ahead for nothing other than the very many snakes that appear everywhere. Shiva wears a snake around his neck – and it is one of the live ones (although again, at times, they swapped it for a fake one) And since Mansa lives in Naglok there is nothing else apart from snake architecture! The multi-headed statue in that film was quite weaselesque – maybe it’s got something to do with proximity to other snake heads? Oh I LOVE this film SO MUCH! It is so so so enjoyable – it’s up there as one of my favourites. 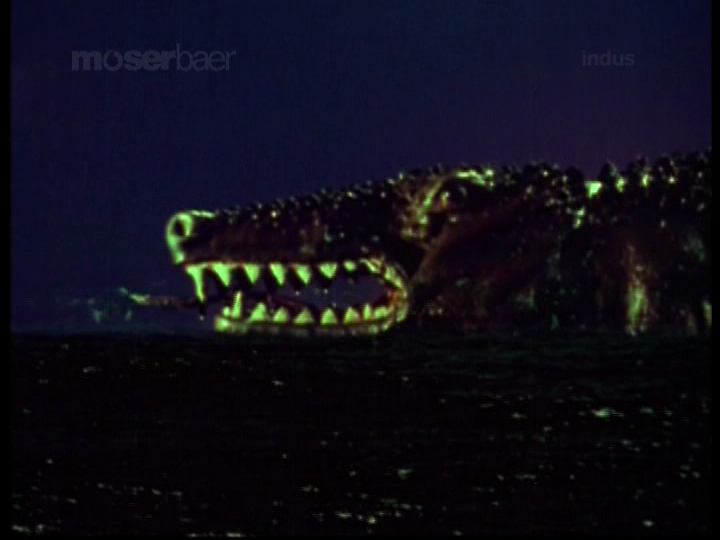 I loved all the mythological stuff and the craycray special effects in it, as much as I loved the snakes. My comment really doesn’t have anything to do with this film per se, as much as the whole film fessstival. I had picked out a classic Telugu movie from the 1950’s to watch during this festival (Nagula Chavithi), but didn’t have time to do so. Anyway, I came here to tell you that earlier today, while watering the plants in my back yard, I suddenly spotted a snake! Yes! I would have stepped on it in another minute. It wasn’t a cobra, and was rather small — not to say tiny (as tiny as the snake in Anandabhadram, reviewed by Dustdevil) — but still: a snake. I couldn’t help thinking it must be due to all the time I’ve been spending reading reviews of various snake films due to this film fesstival. I must say it really rattled me (pun unintended), and I got out of there as fast as I could. Since all this happened on a Friday evening, I’ll have to wait till Monday to call the Animal Control guys, who’ll probably just laugh at me. We have mountain lion sightings in our area, so I doubt they’re going to get very worked up over a (tiny) snake. Eeek! Must be the season! From time to time we get quite a few snake sightings here in the city – thankfully none so far in my back garden. Hope you stay safe & the animal control guys manage to find and relocate the snake!